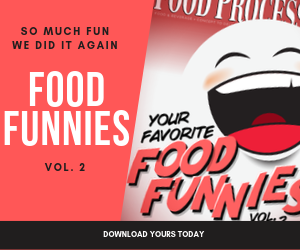 April edition of Food Processing's Food Funnies, a monthly feature guaranteed to give you a good laugh. Congratulations to Ryan Mills for the winning March Caption! Is it just me or do you have the urge to read "James and the giant Peach"? Ok, so we are going to need a lot of salt. Ummmm...can we still make a non-GMO claim on our cans? This still qualifies as ‘Natural’, right? Now that we created it, we need to get Redco to make a slicer big enough, then a bun and hamburger patty big enough to hold a slice. Well, we finally did it! A family size tomato! You say "Tuh-mey-toh" ... I say "Holy COW!" We better not let the NFL know about our new growth hormone! Monsanto eat your heart out! This is the sample our vendor sent over. The new FTC rules are making it ridiculously difficult to develop our new Strawberry Super Fruit Singles. I don’t think this will pass for organic!